Traditionally, landscape painting has served as a marker of place and in particular, national identity. Today, with the ubiquity of internet communication and transnational commerce, and despite various measures to curb the movement of people across borders, national boundaries are proving to be porous entities at best. An excellent, though sadly brief, show of photography and video at Canal View (10 Greene St., SoHo) opens up some bracing new vistas on what landscape can mean in the present moment. All photographs credit Austin Kennedy. Unlike in seventeenth-century Holland, where Vermeer painted his native city in The View of Delft, or nineteenth-century France, where the Impressionists recorded the spread of industrialization into the French countryside, in most of the world today, knowledge of nearby and faraway places is increasingly delivered by mapping software, like Google Earth, and photo sharing sites, like Flickr. 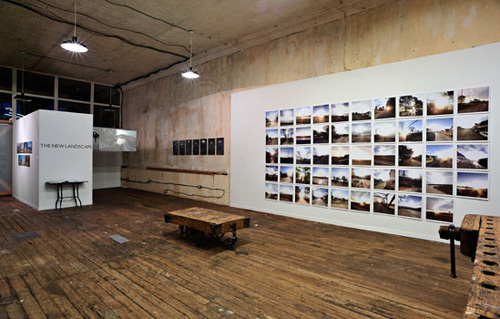 Two series of photographs by Matthew Jensen--one of the sun setting over small-town streets, corn fields, and highways (The 49 States); the second of clouds casting peculiar shadows on the surface of the earth (Feels Like Real)--seek out the lyricism in the standardized, anonymous images one finds in Google's Street View or the airplane window. Whereas representations of paradigmatic places had previously embodied civic pride, colonial aspirations, or national character, Jensen's virtual encounters with America's "non-places" reveal the extent to which technology erases these markers of particular, collectively mythologized identity, as well as its hidden potential to capture a quieter, less partisan vision of the world we think we know. Of course, we should know by now that no instrument is truly universal, and the absence of Third World data in Google Maps' Street View points to the persistent limits to our experience of the world when it is mediated by technology. Rufus Lusk's To Colejon on October 30th upends this order by using real photographs taken on a trip to the Dominican Republic to create an automated journey through a hypothetical Street View of an obscure village. A real journey to the invisible boundary of the Arctic Circle, a site of tourist fascination and fantasy, is the departure point of Georgie Friedman's video, Arctic Circle: mile 115. Here, grainy Super 8 footage of otherworldly, ice-encrusted trees, recorded from the window of a moving car, unfolds to the voices of a computerized radio weather announcer and the car's two passengers, who gradually come to realize that "driving the Dalton Highway mustn't be undertaken lightly." 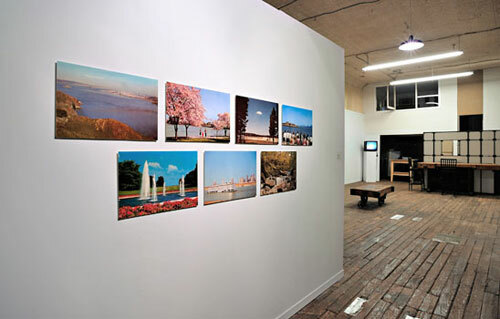 Interventions in the landscape and on the gallery wall point to another avenue of exploration. 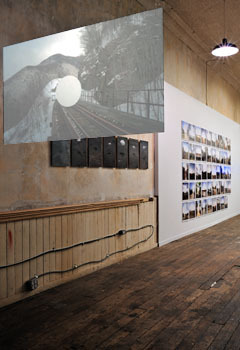 In Gap at Crawford Notch, a video projection by Rufus Lusk, Tim Lynch, and Miguel Drake-McLaughlin, a peculiar white spot appears on the screen and begins to recede along a set of train tracks in the snowy mountains of New Hampshire. In Austin Kennedy's Twenty-Nine, a series of small, black-and-white photographs of landing strips and driveways, bedrooms and restaurants taken over the course of a year, is arranged irregularly on the wall and connected by faint pencil lines in a mysterious personal schema. Without a clear key for decoding this enigmatic collection of moments, the familiar world is made strange and we are left to bring our own experiences and imagination to make sense of it all. Finally, it is the visual language of landscape--what we often think of as simply the landscape itself--that continues to hold sway over our emotions. This language of place is by turns reassuring in its sense of familiarity and terrifying when our expectations are frustrated. Both Austin Kennedy's 7 Landscapes and Georgie Friedman's Seas and Skies, Track A draw on the tradition of the photographic landscape: the vintage postcards of the 1950s and 1960s in the former and nineteenth-century composite prints of seascapes in the latter. Instead of fashioning a seamless fusion of different exposures to solve a technical difficulty, as did her Victorian predecessors, Friedman pairs incongruous portions of water and sky to create an unsettling image in which the horizon seems to drop off abruptly just beyond our field of vision. Meanwhile, Kennedy paints out the monuments in enlarged tourist postcards of American landmarks. The resulting images are uncanny in their attraction, as our collective attention is displaced from icons of America at the height of its power to empty sites that nevertheless call to us and seem to draw us in. "The New Landscape" is a show full of fresh, interesting work that insists that the landscape tradition is far from fallow. It sets out to explore the brave new world of digitally viewed landscapes without overlooking the real connection between a sense of place and identity. The fact that art has always played a key role in maintaining this connection should not give us pause. The show's upcoming closing date definitely should.